The UN refugee agency’s new Global Trends 2012 report puts refugee arrivals to Australia into context. It also shows that Australia’s recent increase in refugee arrivals has been a product of a global surge in refugee numbers, with 7.6 million people newly displaced, the highest number since 1999. In the 12 months to June 30 this year around 25,000 asylum seekers arrived here by boat, a figure which has sent the government into hysterics. Yet it still only made up 13 per cent of Australia’s total immigration intake for the year and was only marginally above the expected refugee intake, recently raised to 20,000. Far more people (out of attachment to home or lack of means of escape) stay in their home state than cross a border to seek refuge. Out of 45 million people forcibly displaced by the end of 2012, the vast majority (28.8 million) were internally displaced. Those that do leave their countries do so out of sheer necessity. Pakistan, with 1.6 million refugees, remains the top host country, followed by Iran with 868,200. Pakistan is not a signatory to the Refugee Convention, and the situation of refugees there remains acute. Hazaras in Quetta, where the ethnic minority is concentrated, are in a state of siege from Sunni extremists. Hundreds have been killed in recent years. Last month a market bomb blast killed 28 people. Pakistan is threatening to expel thousands of Hazara refugees back over the border into Afghanistan. Last year on average 23,000 people per day were forced to seek asylum—almost the entire year’s asylum claims in Australia. At the end of 2012, Australia hosted only 0.3 per cent of the world’s refugees, and 2.14 per cent of its asylum seekers. Australia’s stance is emblematic of the rich countries’ more generally. Fully 81 per cent of refugees worldwide are hosted by developing countries. 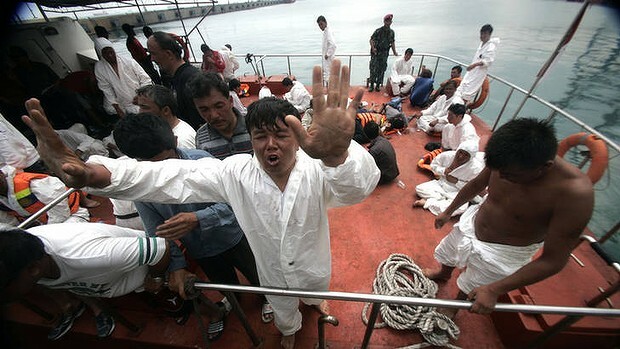 No amount of deterrence can stop desperate people boarding boats. Only immediate resettlement of refugees from Indonesia and a policy that prioritises safe passage for boats that do come—rather than crackdowns on people smuggling and efforts to shirk Australia’s responsibilities—can guarantee the rights of refugees.